Pasta is a well-loved cooking staple—inexpensive to make, yet versatile enough to turn into so many dishes. Many countries have their own versions of this flour, egg and water combination. The Germans have their spaetlze, while the Polish have pocket-like pierogis. Meanwhile, pasta is linked to Italian cuisine since it has been a staple in traditional Italian cooking for the longest time. Pasta is definitely more than just spaghetti noodles tossed in tomato sauce. The noodles have variances in cut, shape and thickness. Today, many restaurants use pasta as the base for a myriad of recipes, and add Asian ingredients to create fusion dishes or remakes of the classics. The type of noodle you have plays a huge factor on the kind of sauce, oil and ingredients you pair it with. Here are 15 pasta profiles, along with some simple pasta recipes to get you started. The thinnest type of pasta, consisting of long and very fine strands. Works with: Delicate sauces like a light tomato sauce, or just cooked in butter and oil. Long, thin strips of pasta. Slightly thicker than spaghetti in width. Works with: "Wet sauces" such as seafood or clam-based sauces, as well as cream and tomato sauces. Wide egg noodle that originated in Tuscany. Works with: Hearty meat sauces like Bolognese. Flat and ribbon-like pasta. In-between a linguine and pappardelle in terms of width. Works with: Thick sauces. Fettucine Alfredo is a typical dish. Small, curved and bent tubes of pasta. Works with: Tomato and cream sauces. One well-known combination is with cheese (mac n' cheese). Smaller sizes can be used in cold salads. A large, tube-shaped pasta, much like a very big ziti. Works with: Cheese and a thick sauce stuffing, then baked. Tube-shaped pasta about 2 inches long, Cut diagonally on both ends. Works with: Any kind of sauce. It's very versatile noodle! Medium-sized tubes of pasta. It looks like penne but with a smooth surface. Does not have diagonally-cut ends. Works with: Sticky sauces that adhere to the pasta's ridges. Often baked like a casserole (baked ziti). Also known as “bow tie pasta”. Works with: Cream sauce or as a cold pasta salad. Tiny dumplings made with potatoes, eggs and flour. Works with: Rich sauces, and can even be baked. Conch-like with a variety of sizes. Works with: Soups and stews (small shells), meat sauces and casseroles (medium shells), or cheese baked (large shells). Tightly wound spirals of pasta. “Curly” in appearance. Works with: Sticky tomato and cream-based sauces that adhere to the pasta's nooks and crannies. Can also be used in making cold pasta salads. Works with: Soups and salads. Large sheet with ridged edges. Works with: Layers of sauce, meat and cheese. Usually baked like a casserole but can also be rolled up. Sheets of pasta pressed together to form small pockets. Works with: Meat, vegetables and/or cheese fillings. Get started with these mouth-watering recipe ideas! These tweaks to easy dinner recipes will be a sure hit in your restaurant, especially for diners who look for comfort food or a taste of home. Give this spicy Korean classic a twist by adding penne pasta to their Korean rice cakes. Cook them all in gochujang, spicy Korean chilli paste and some sugar for an Asian-style pasta sauce. Top with cheese and toast until melted. Instead of the usual mac n’ cheese, try turning your macaroni into a cold salad! Use mayonnaise as your sauce, then add in a mix of diced vegetables—from carrots to celery—and don’t forget some raisins and pineapple chunks for added sweetness. Add a twist to the well-loved baked lasagne recipe by spreading a mixture of ground beef and bell pepper tomato sauce. Top with some goat’s cheese, roll it up and bake it in the oven for easy, individual servings. 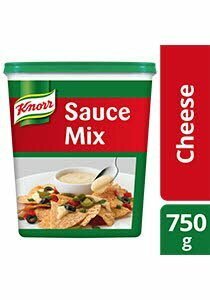 Knorr Cheese Sauce Mix is a tasty western sauce and easy to prepare. 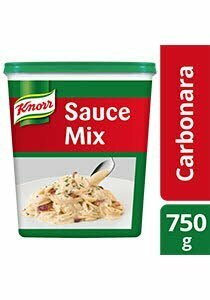 Knorr Cheese Sauce Mix is great to be served as a pour over on pasta, meats and vegetables. Add milk or cream for richer taste. 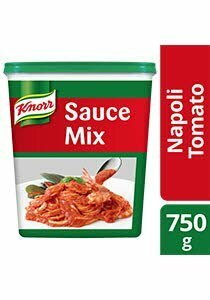 With Knorr Napoli Tomato Sauce Mix, tomato based sauces are so easy to prepare. Just add water to get a versatile tomato sauce based from which you can create all your tomato dishes. It offers a natural pulpy consistency and is suitable for Western and Asian dishes. You can use Knorr Napoli Tomato Sauce Mix as a modern ingredient or directly as a pour-over sauce. With Knorr White Sauce Mix, white sauces are so easy to prepare. Just add water to create your personalized white sauce. It is also perfect for other white sauce based sauces, like cheese sauce, parsley sauce or mushroom sauce. So irresistible! 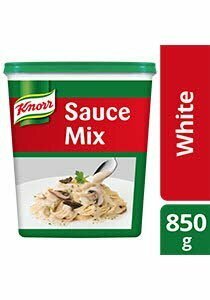 Create your signature sauces with Knorr White Sauce Mix.